18w16a is the last playable snapshot for me. In all later versions when I click "play" in the launcher the game either doesn't open at all while the launcher itself closes, or it tells me "GAME CRASH". 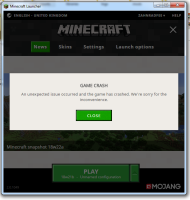 That "Game Crash" message occurs only in version 18w21b. In all cases there is no crash report filed.